Look what I found over at retail store? G.I Joe the movie figures. In fact, it has been retail for few weeks already. The 3.75 inches figures are going each for $18.90 on retail. No discount so far. Some of the detail are quite good especially for Baroness. Just look at her. I think she will be a "HOT" figure. 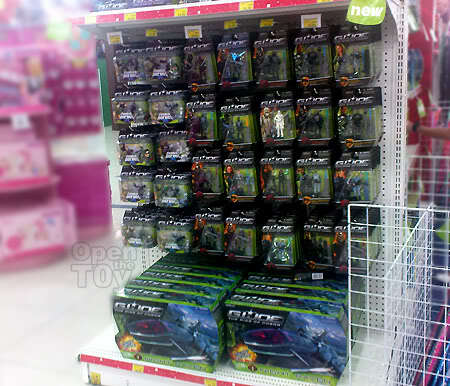 They are a number of vehicles in the series for both G.I Joe and Cobra, some 12 inches figures but no Snake eyes sighted and they are two toy swords to choose from for the kids. I just hope the coming movie will be good. That is pretty expensive! This line was just released here and we already have a 30% off sale on them. They are going for about $7 each here in Canada for two weeks. We always have a sale on movie toys just prior to the movie debute just like TF2. I am looking forward for the movie as well. Waiting for discount for the figures as it is too ex for me. Canada was doing right for the discount sales for the movie debuts. That's how it should be and not high jacking movie figures prices. We learn to be wise now. We will wait. They are pretty expensive for 3.75 inch figures. Almost the same price as 6 inch figures. Still, I'm looking forward to seeing how the movie turns out too. Have not seen them in our local toy store yet. 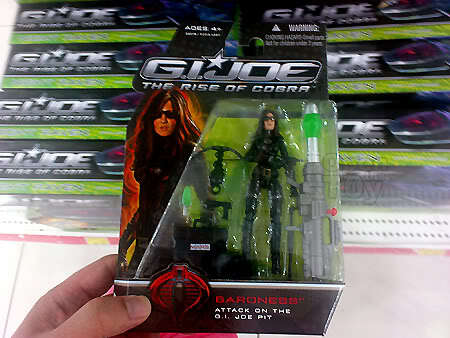 Was never a big G.I Joe fan, so I might give this a miss. I'm a mech kind of guy and I just want to watch the movie. Hee! Hee! You got it right. The pricing was close to 6 inches pricing. I don't know what Hasbro is doing but we are waiting they will be selling it at the price of Indiana Jones after the movie fever goes down no doubt. If you saw that over your end, do let us know with the pricing thank you. For snake eyes, there are not much different from the 25th anniversary series I think. There are some pretty cool vehicle too in the toy series too. You should check it out. I picked up that Baroness figure, I'm trying to limit my movie figure purchases to 3 or 4. Though I did also see a non-movie, movie figure with a snowmobile that looked sort of fun.